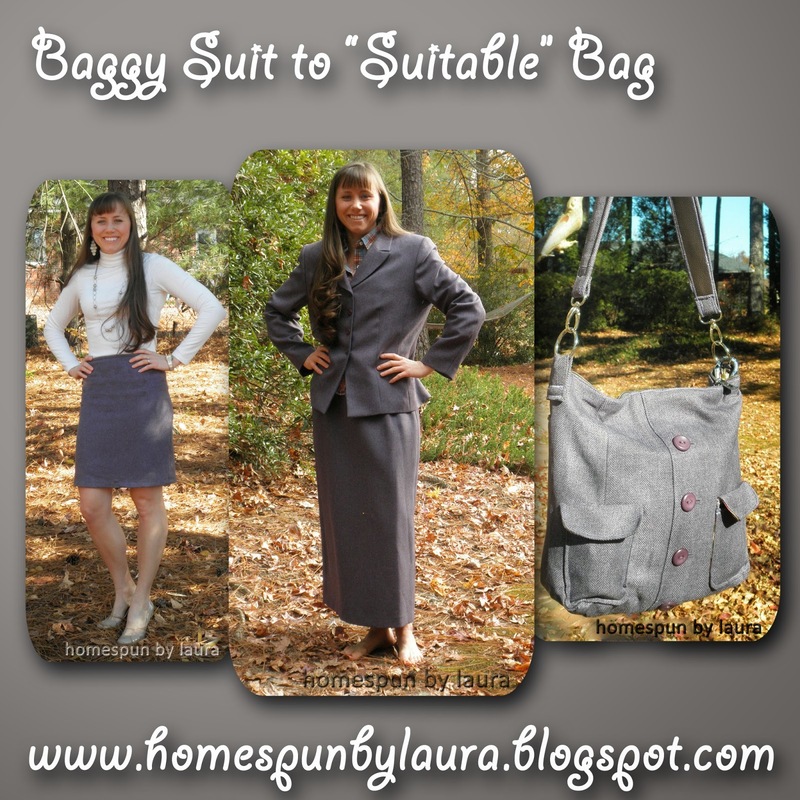 Baggy Suit to “Suitable” Bag! I found this too-big-for-me wool suit for $3 on the last day of an estate sale and decided to try making a purse out of it. It’s a two-piece suit, so I decided I would also take in the skirt to prevent waste! 1 – I began with the skirt by marking and cutting off excess fabric at the bottom and taking it in at the sides of both the outer layer and the lining. 2 – I finished up by opening the slit up a few inches and hemming up the bottom, again for both layers. 1 – To start on the purse, I measured, marked, and cut two squares from the front and back of blazer. 2 – Using the zipper foot, I stitched up the front of the blazer next to the buttons to make sure it stays shut (this part became the front of the bag). 3 – I cut heavyweight interfacing to fit the blazer squares and attached it with the iron. 4 – I wanted to have pockets on the front of the blazer, so I drew a pattern and used it to cut two pockets and two flaps out of the suit fabric, the lining, and the medium interfacing. After basting the lining to the pockets and adding the magnetic closures, I pinned and sewed the pockets to the front flap. 5 – Time to make the lining! I cut two pieces of lining and medium-weight interfacing the same size as the blazer squares and ironed together, resulting in two pieces, one for front and one for back. On the front piece, I added a zippered pocket for my brush, lip stuff, etc. On the back piece, I added two open pockets for my phone, notepad/coupons, etc. 6 – Time to make this thing zip. I started with the zipper by stitching it to the front blazer piece, then to the back blazer piece. 7 – To attach the lining to the top of the bag, I pinned the lining pieces to the blazer pieces, making sure they were far enough away from the zipper that they wouldn’t catch. I wanted to sew with the lining side down, so I re-pinned the pieces from the outside, then followed the line of stitches from step #7 that attach the blazer to the zipper (with lining side down so I could see where to stitch). 8 – Before stitching the outside (blazer) pieces together, I remembered that I wanted to add a zippered pouch to the outside back of the bag, so I cut and prepared a piece for the pocket (blazer rectangle, heavyweight and medium-weight interfacing rectangles, and rectangle of floral fabric for lining). After pulling all the inside lining aside, I stitched the pocket to the zipper, which I then stitched to the back blazer piece. 9 – With right sides together, main zipper unzipped, and lining pulled out of the way, I sewed all the way around the blazer pieces twice, to make sure the bag would be secure. Before moving on to the lining, I went ahead and boxed the edges of the ouside layer of the bag so it would sit flat when finished. 10 – This was also the time to create the attachment flaps for the strap, since they needed to be attached BEFORE I finished with the lining. I cut two pieces of blazer fabric down to size, measuring against the rings, then cut two strips of the heavyweight interfacing to fit inside the pieces, ironed around the interfacing, and stitched at the sides. Before stitching across the flaps, I threaded both flaps through a ring. I then pinned and stitched (back and forth several times to make sure the attachment was strong) the flaps to the bag. 11 – With right sides together, main zipper unzipped, and blazer pieces pulled out of the way, I pinned and stitched all the way around the lining, leaving about 2/3 of the bottom edge unsewn so I could turn the bag right-side out after I boxed the edges of the lining. I then pinned, pressed, and stitched the remaining 2/3 of the bottom length of the lining shut. 12 – Since it would be super annoying to hold the bag in my hand all the time, I added a strap. 🙂 I did this by cutting a long length (eyeballing it, as always!) from the excess fabric I cut off the bottom of the skirt. I tapered the ends of the strap so they’d fit through the ring clips that would attach the strap to the bag. I basted the blazer fabric over a length of canvas webbing, then cut a strip of vinyl about 1/3″ narrower than the strap, centered it and pinned it down (covering the raw edges of the blazer fabric). I used a zig-zag stitch to trace over my basting stitch and fasten the vinyl to the strap. Next, I threaded the strap through the ring clips and stitched it down securely. 13 – Last, I clipped the strap to the bag and transferred items from the purse I was using into my new one!